Thomas Alva Edison’s invention of the talking tin foil, for which he borrowed from another inventor the term ‘phonograph’ (‘voice-writer’), dates back to 1877, the year after Alexander Graham Bell, using a word that had been around even longer, patented his first telephone (‘distant voice’). There are two ways of seeing this act of invention. In one version, it was the realization of an old dream, answering to ancient susceptibilities. The French photographer Nadar, greeting Edison’s invention, said it was as if Rabelais’s tale of the sea of frozen words, which released voices into the air when it melted, had passed from the imaginary to the real. Rabelais was dead only thirty-five years when in 1589 the Italian scientist Giovanni Batista della Porta, one of the inventors of the telescope, imagined that he had ‘devised a way to preserve words, that have been pronounced, inside lead pipes, in such a manner that they burst forth from them when one removes the cover’. Around the same time a Nuremberg optician suggested enclosing echoes inside bottles, where he thought they would keep for a few hours at least. Acoustics was not yet a named branch of science — the term was only introduced in the early eighteenth century by Joseph Sauveur, following a century of investigations by Vincenzo Galilei (father of Galileo), Mersenne, Kepler, Bacon and Descartes. More advances followed, beginning in the 1820s, especially on the part of a number of French researchers. The velocity of sound at different temperatures was established by Gay-Lussac, Arago and others; Savart invented a toothed wheel for determining the number of vibrations per second for a given musical pitch; Helmholtz established the laws of harmonics; Lissajous projected light vibrations onto a screen as a series of sinusoidal curves; and the writing of John Tyndil (his book on sound was published in England in 1867) helped to popularize the subject. But when the moment materialized, the invention of the phonograph proved remarkably simple, almost as if this new knowledge scarcely counted. It was certainly much simpler than that of cinematography fifteen years or so later, for which Edison also shares some of the credit. 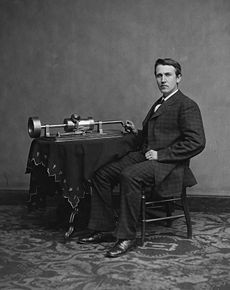 Although both of them involved assorted precursors, Edison’s phonograph of 1877 used little by way of scientific knowledge and no new materials. Two American writers, Oliver Read and Walter T. Welch, authors of the most detailed technical account of the invention, point out that all the basic components of the phonograph were already known. The stylus had been in use since ancient times. The diaphragm or tympanum had been known since the time of Hippocrates, from human and animal dissection. The feed screw was invented by Archimedes. A speaking trumpet was shown by Leonardo in a sketch for a tube communication system for the palace of the Duke of Milan. Cylinders and discs were known from the use of the lathe. The problem with this account is that it hardly explains why the phonograph was not invented earlier, or leaves you to suppose that it only awaited the genius of the right inventor. But this is bad history. Inventions never just appear out of a vacuum in the mind of the inventor, and there are usually several inventors at work simultaneously on similar endeavours, sometimes in competition and sometimes in ignorance of each other; for it is social, economic and cultural circumstances that motivate the invention and the direction of the inventor’s imagination. The phonograph is no exception.